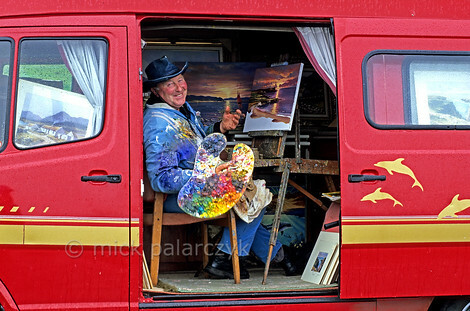 The rain is pouring down on his van on a grey day at White Park Bay in Northern Ireland, but that doesn't prevent this good humoured Irishman from painting a colourful sunset on his canvas (Photo Mick Palarczyk). How long did it take to grow all that hair?" 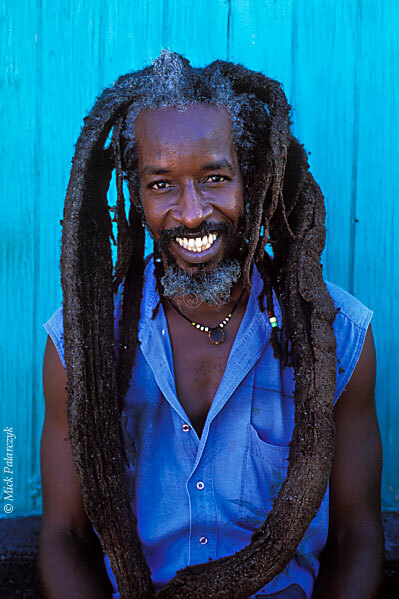 Antillian Roland Joe, better known as Ras Bushman, smiles. "Already as a youth I wanted to be a Rastafarian. Since then no hairdresser was allowed to touch my scalp, of course." 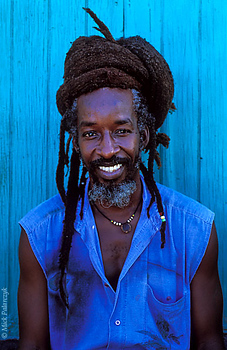 You can enjoy his hairdo in Philipsburg, on the island of St. Martin, where he runs the vegetarian restaurant Freedom Fighters Ital Shack. All the food is home grown and tastes really good. Ras is a musician as well, but he has retired from the band Freedom Fighters he founded. His son has taken over. Often you hear their reggae sound coming out of the shack. (Photos Mick Palarczyk). These pictures are part of the feature Netherlands Antilles: Saba, St. Eustatius and St. Martin. 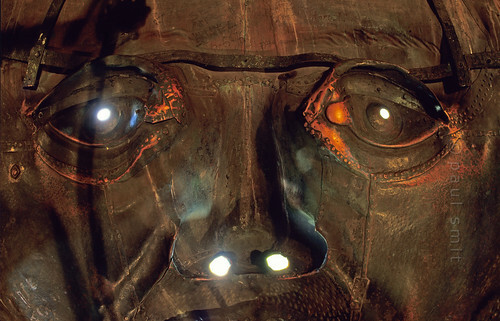 A child enjoys the view from the back of a giant (photo below). 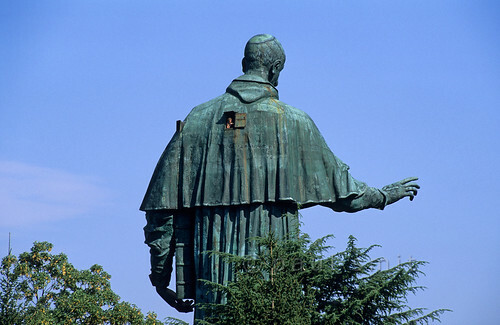 The Colosso di San Carlone from 1698, a huge copper statue of a canonized member of the powerful Borromeo family, overlooks the slopes along the Lago Maggiore near Arona in Italy, and blesses the landscape. As an ordinary mortal you can view the world through his holy eyes if you climb the narrow stairs leading up into his head (photo above). Photos by Paul Smit. These photos are part of the feature Lago Maggiore. In the last two decades Dresden has become a fashionable and arty city. The Kunsthof Passage in the hip Neustadt quarter is an example: an explosion of architectural creativity, like here in the Hof der Elemente (Courtyard of the Elements). 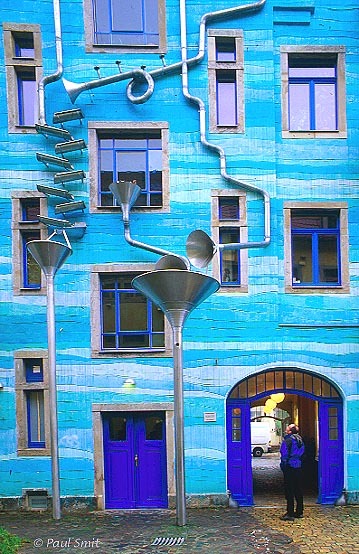 This facade makes music when it rains. (Photo Paul Smit). 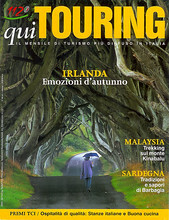 Telling Images: Pumpkin Soup With Sour Cream? 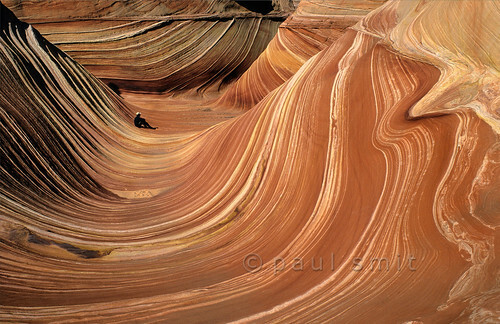 The Wave, situated in the Vermilion Cliffs Wilderness Area, is one of the most bizarre landscapes in the USA. It looks like a wave of sour cream stirred into pumpkin soup. But it is made of sandstone. Once this sand was deposited in an old desert, kitted together, and was covered and buried. But when the Colorado Plateau was uplifted it surfaced. Rare desert storms did the sculpting (foto Paul Smit). This photo is part of the feature In Search of the Wave..